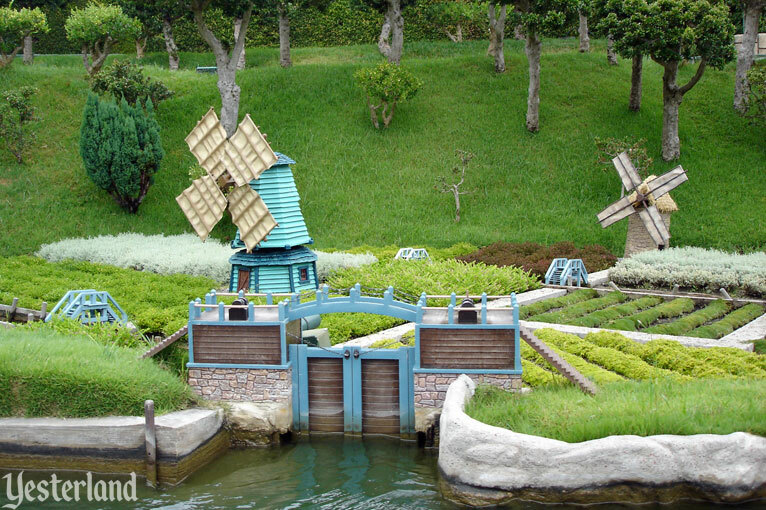 You’re in a Dutch canal boat at Yesterland, so it’s fitting that you’re cruising past Dutch windmills. 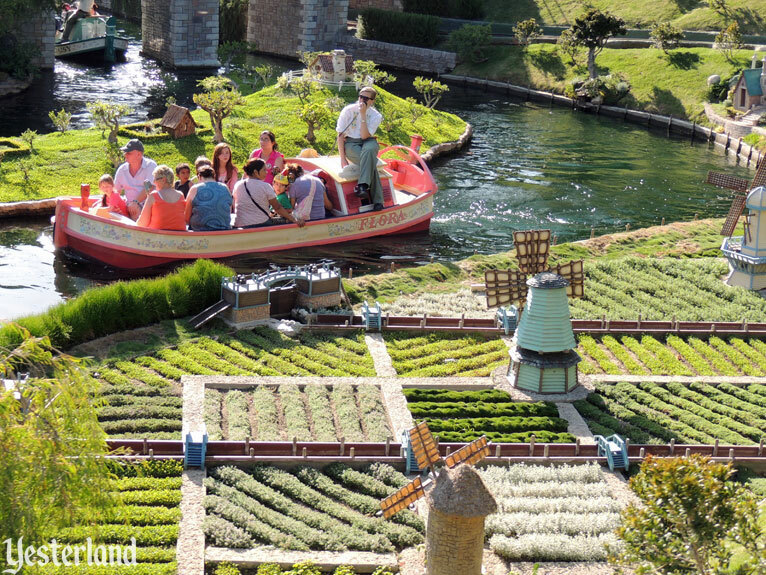 This ride’s Holland has not only the three windmills, but an elaborate miniature farmland with canals, locks, sluices, rows of crops, and bridges. 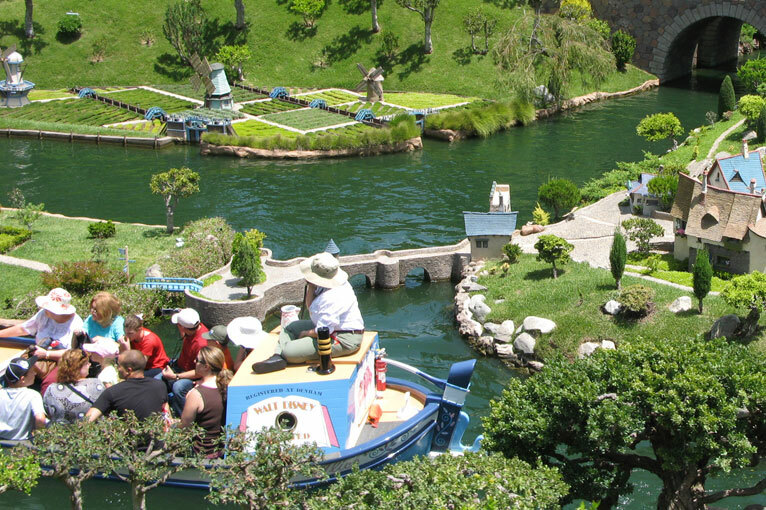 It’s one of the many delightful scenes of the Storybook Land Canal Boats. Walt Disney’s 1937 animated short The Old Mill had the first use of the innovative Multiplane Camera, which gave the film stunning depth and perspective. The film’s “plot” is simple: Animals survive a destructive thunderstorm in a decrepit windmill, as the storm batters it. The scenes are inventive and artistic. In some ways, the film was a “study” for techniques that would be used in Snow White and the Seven Dwarfs, which premiered later the same year. Compared to the derelict windmill in the 1937 film, the center windmill here is pristine. Perhaps it’s the same windmill, but many years before it was abandoned. Maybe it’s the New Mill that later became the Old Mill. 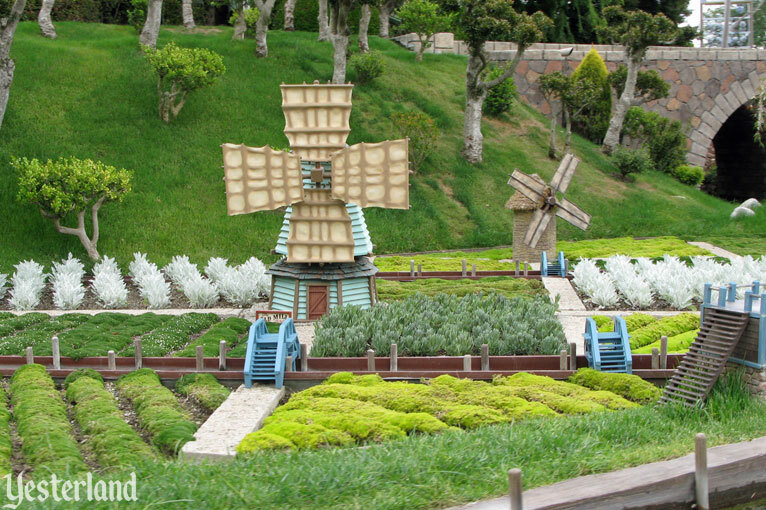 The two other Dutch windmills here—the “General Mills”—show off different styles. Holland is part of the Kingdom of the Netherlands. Netherlands means low countries or lowlands. Even before the massive land reclamation engineering projects of the 20th century, much of the country was essentially around sea level, so dikes, drainage, and flood protection have long been necessities. 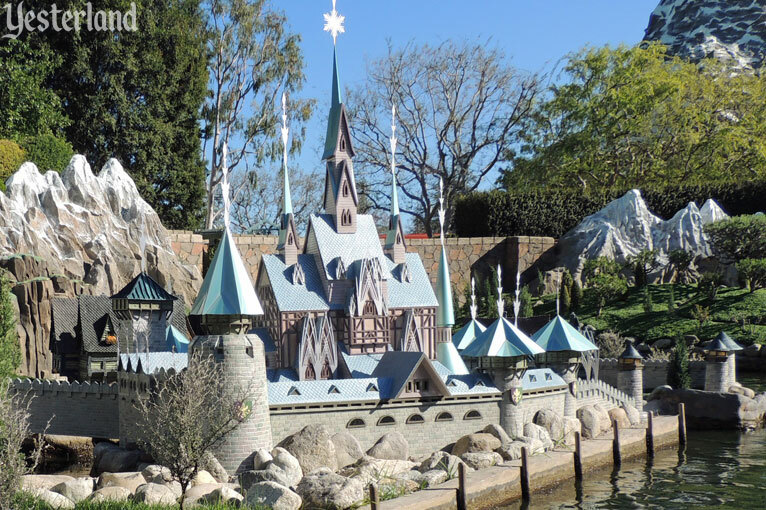 Although not on the scale of Haunted Mansion Holiday or “it’s a small world” Holiday, there are also holiday decorations at Storybook Land Canal Boats. 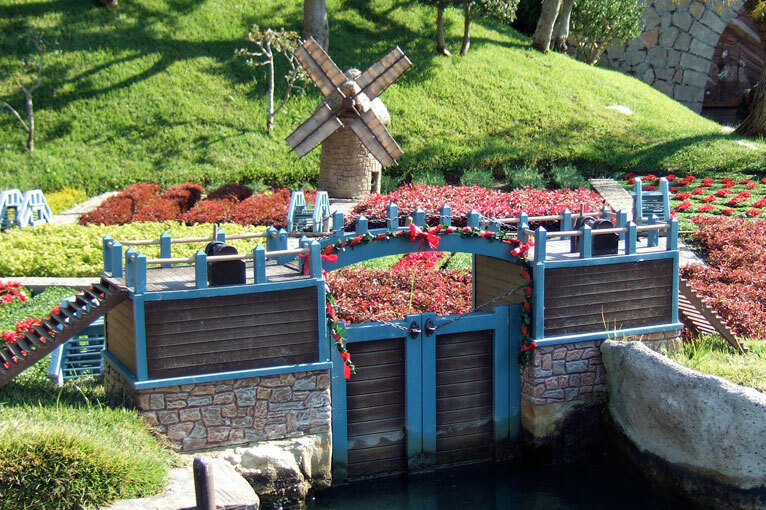 Even the canal gates are decorated—which is probably not something you would see in the real Holland. 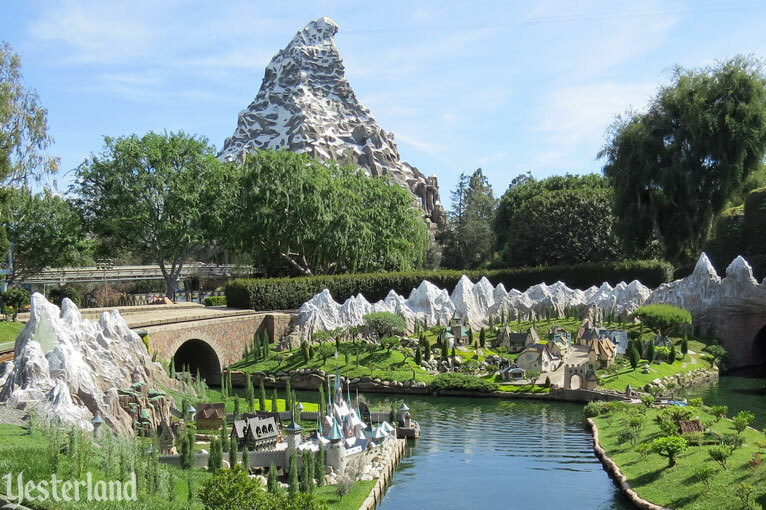 A decade before “it’s a small world” (1966) began taking Disneyland guests on “the happiest cruise that ever sailed ‘round the world,” Canal Boats of the World (1955) became Storybook Land Canal Boats (1956), taking guests to England, France, Germany, Italy, and Holland. 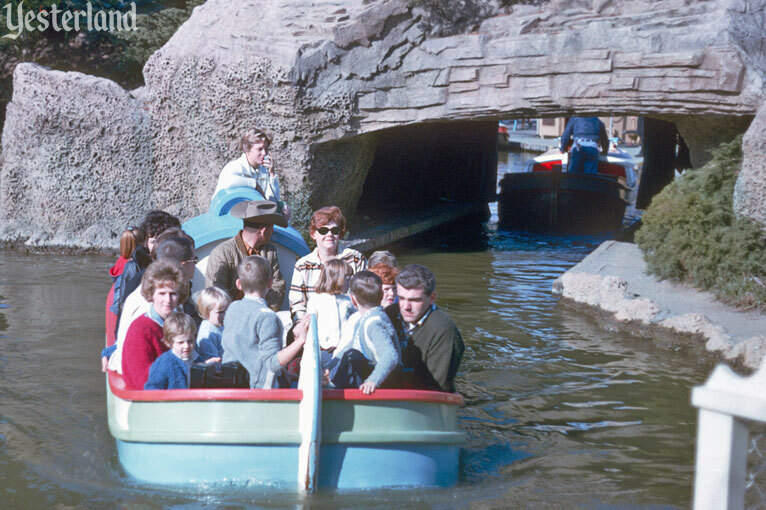 Many of the ride’s scenes are still much as they were in 1956. 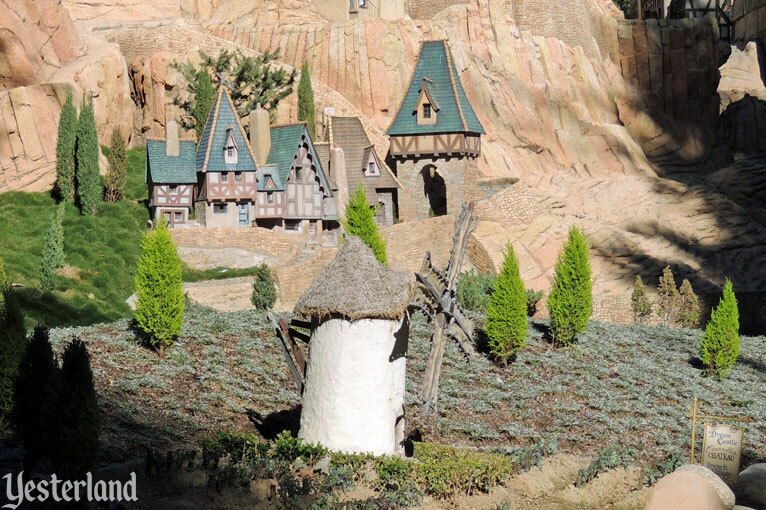 Carefully scaled landscaping enhances the miniature villages. The gentle ride is a throwback to the past—but it’s also been updated over the years. In 2014, the Dutch landscape of The Old Mill disappeared. It was replaced by the fictional kingdom of Arendelle—inspired by the architecture and geography of Norway—from the mega-hit animated feature Frozen (2013). 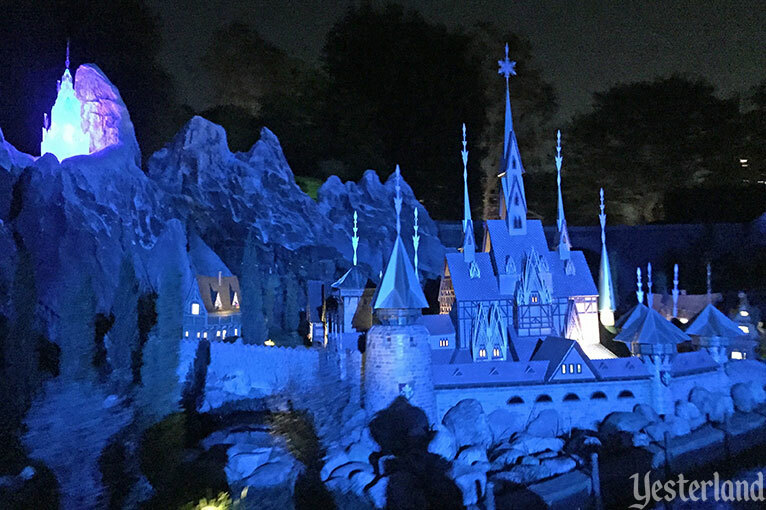 The mountains of Arendelle blend nicely with the Italian Alps behind Pinocchio’s village and Matterhorn mountain—especially when viewed from the Casey Jr. Circus Train. 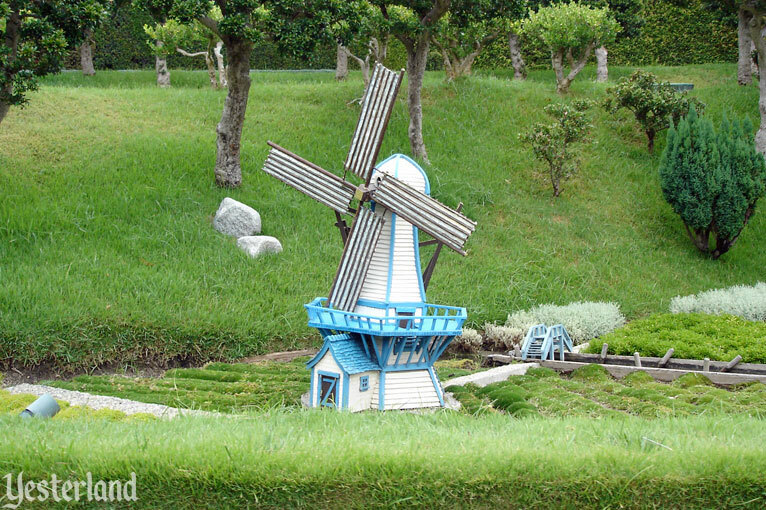 The Arendelle scene is far more elaborate than the Dutch windmill scene. And it’s safe to say that Frozen has far more fans these days than The Old Mill. 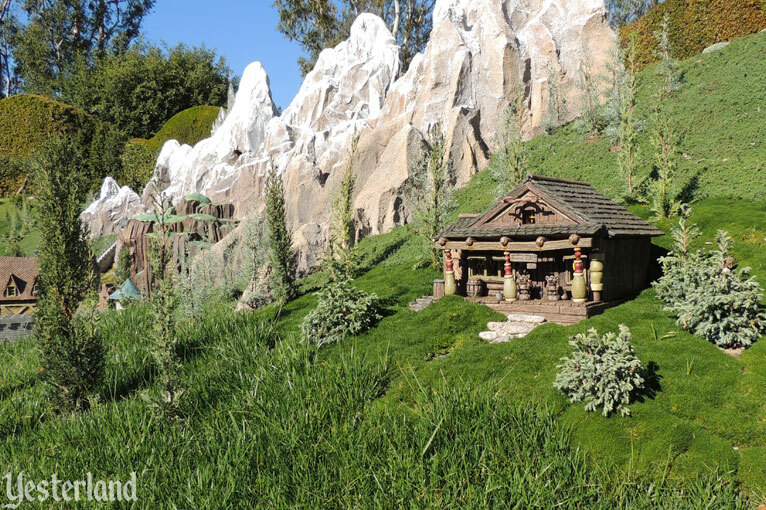 Even Wandering Oaken’s Trading Post is now part of the ride. By day, it’s easy to miss Elsa’s Ice Palace on a mountaintop as you focus on the details of the castle and harbor below. But at night, the Ice Palace is a glowing jewel. You can still see a windmill on the ride. It’s at the French village below Cinderella’s castle, but it’s not homage to the departed Dutch windmills; it’s been there since 1956. 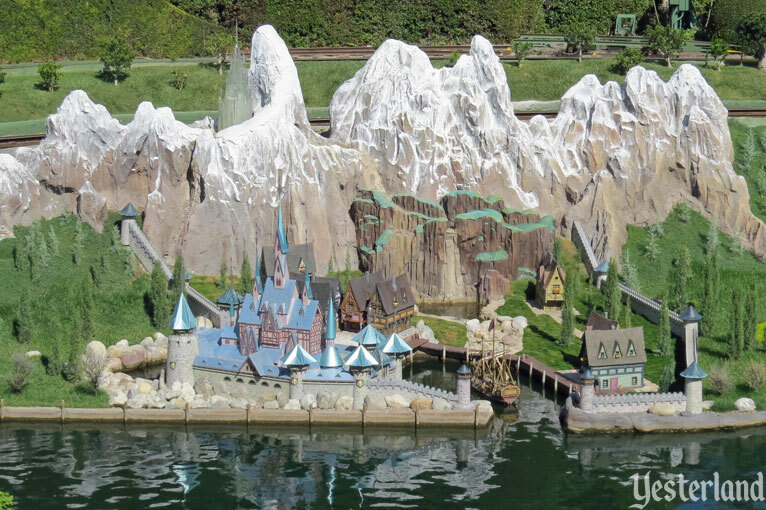 Arendelle is not the only major change to the Storybook Land Canal Boats. A major renovation in 1994 added scenes from two Disney features of that era. Originally, Toad Hall from Walt Disney’s The Wind and the Willows (1949) had one of the most prominent locations of the ride. 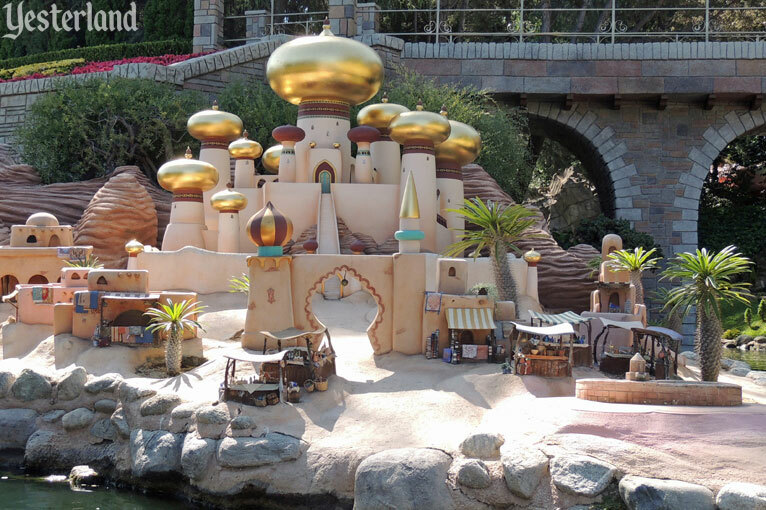 In 1994, the Sultan’s Palace and marketplace of Agrabah from the animated feature Aladdin (1992) took its place. 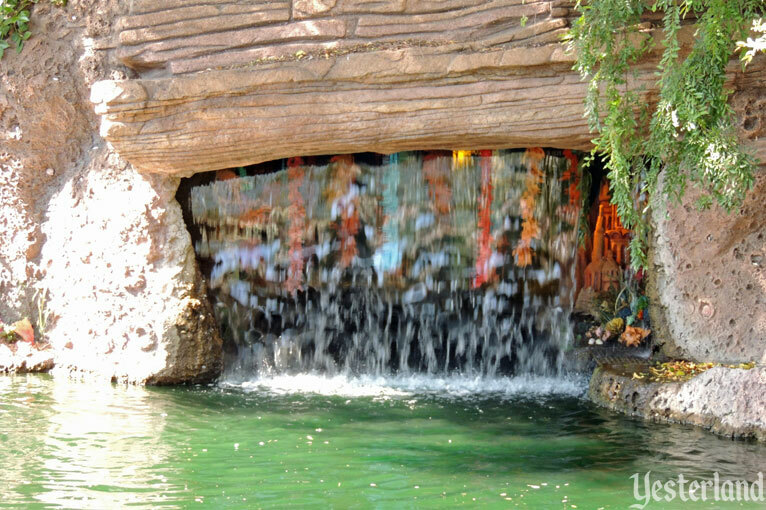 The nearby tunnel became the Cave of Wonders with Aladdin’s lamp. 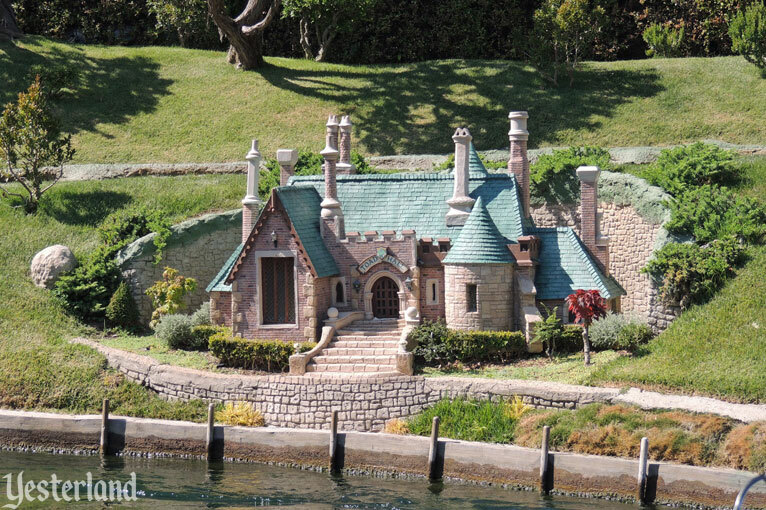 Toad Hall disappeared—but not forever. 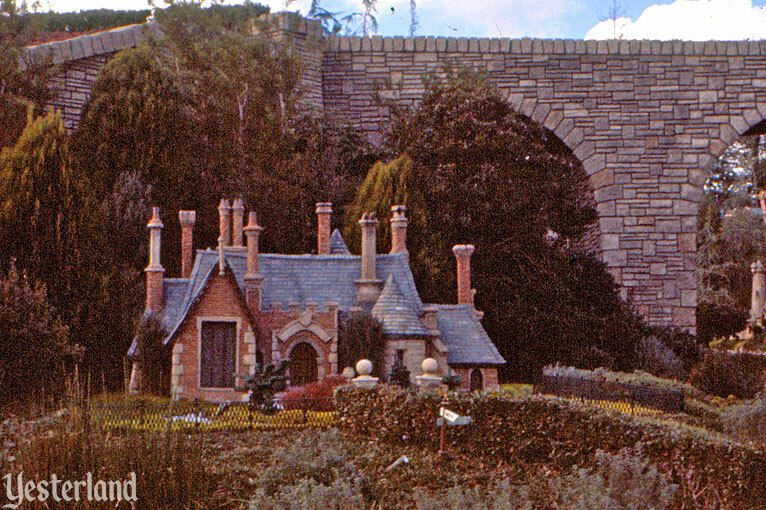 Toad Hall returned in 1995 in a new spot just before the windmills. In 1994, Neverland became King Triton’s Castle and underwater kingdom from The Little Mermaid (1989). What had been a view into a backstage area—part of the show only because of the narration—became an actual show scene, with Prince Eric’s seaside palace and ship nearby. There are still underused sections along the canals—room for future enhancements.